Employment documentation goes far beyond keeping interview records and issuing offer letters. The process is complex with a wide variety of requirements and hence needs quite a pile of records to be kept for assuring compliance with the laws. 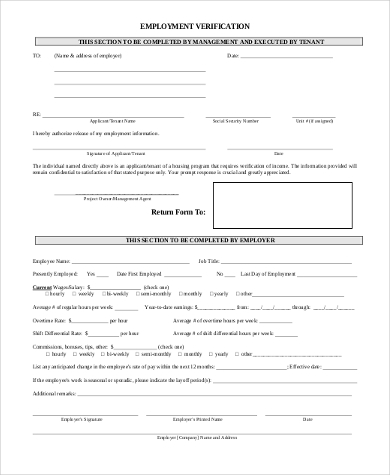 This list of Employment Forms includes templates covering different requirements from an application for employment, pre-employment interview, employment renewal, employment history, unemployment records, and self –employment documentation needs. Go through the list and choose the format that suits you. 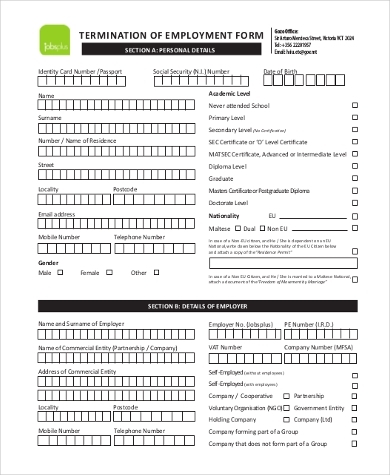 This printable pre-employment document template is useful for employers. It contains all job conditions and candidate signature and date as a proof of understanding the conditions and answering the queries. 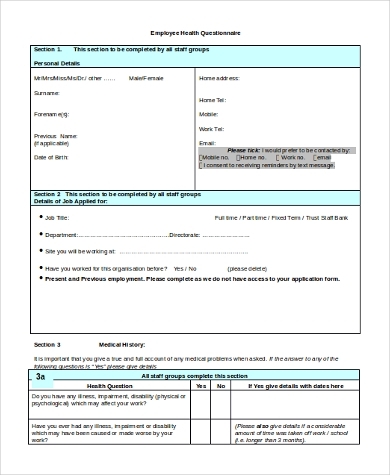 This template can be used by employers for reporting the details of new employment to the authorities. This includes employer and employee details in box form with instructions for filling up. You can also see Employment Authorization Forms. 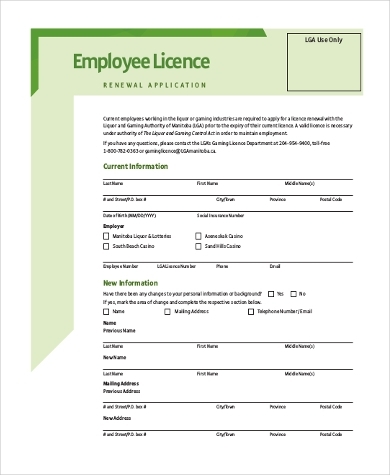 This PDF template is useful for employees who are employed in liquor and gaming sectors for renewing their licenses. It covers all details with current and new information and employee declaration. 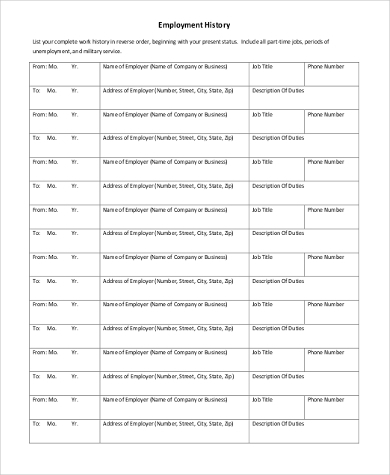 This template may be used by anyone for listing the history of all types of employment, unemployment and military services with details of the employer, job description from the present to the past. This resume template is useful while applying for employment. It covers details of the applicant with education, short-term courses attended, training, employment details, research papers, known languages, references, and declaration. This self-employment template is for submitting information about new business and has to be notarized. It includes details of the person, home & office address, working hours, income & expenses, acknowledgments. 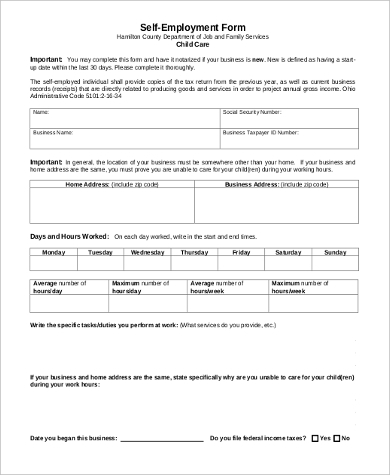 You may also see Self-Employment Forms. This template is useful for complying with the requirements. It includes the name & address of the employer and the details of the employee including current wages in two different sections. 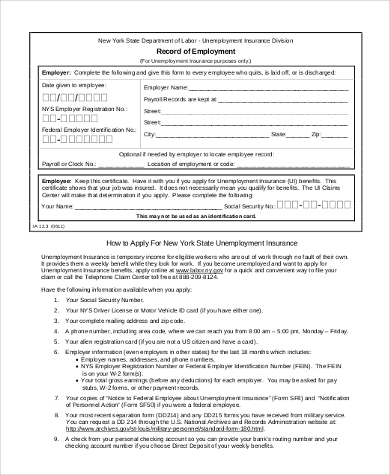 You may also see Employment Verification Forms. This template is to be used by employers when an employee leaves or laid-off or terminated. It includes details of the employer and employee to keep records for unemployed insurance. Any person doing business can use this template. It contains details of the person, business details, business income, income & expenditure details, future trends, payments made in a pension scheme and declaration. 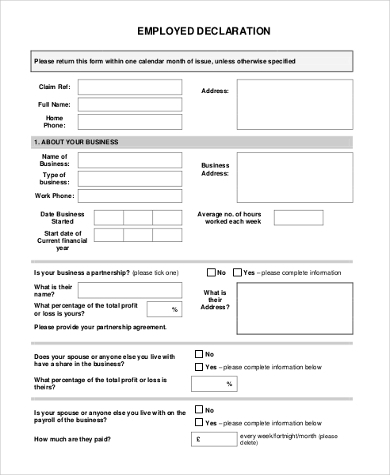 What are The Advantages of Using Employment Form Templates? These templates cover different situations of employment and meet all information requirements. Moreover, the information details and their sequence differ from one organization to other and this makes documentation quite hard. Using these employment templates one can start drafting his own application or start filling up forms for complying with the requirements of the authorities. These templates give every detail in a structured manner for easy filling and are available free of cost. Thus, it saves time, money and avoids mistakes. You may also see Employee Termination Forms. 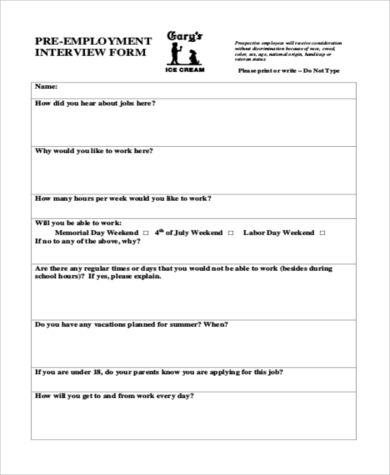 Who Can Use These Employment Form Templates? The employment landscape is very wide and complex. Every other organization needs information in a different sequence making the job application process confusing. As per Federal law, every employer is required to maintain all records of employment and send those to the authorities. They have to issue a certificate of unemployment for the purpose of unemployment pension when any employee leaves the job or the employee has been laid off or discharged. These templates can be used by the applicants, employers, and self-employed individuals. You can also see Employment Contract Forms. Employment documentation requirements vary widely. It requires a lot of time and resources for filling those up with all relevant information. This list covers a wide range of employment templates absolutely ready for using. 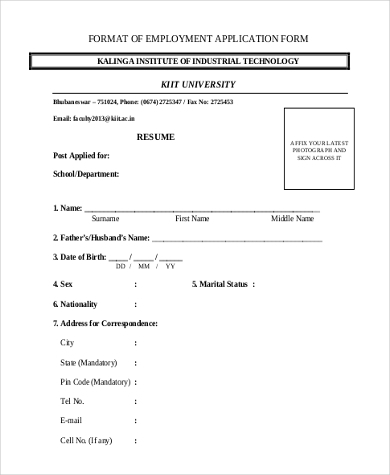 One can download these Employment Forms and draft application for appointment or other employment related documents easily.